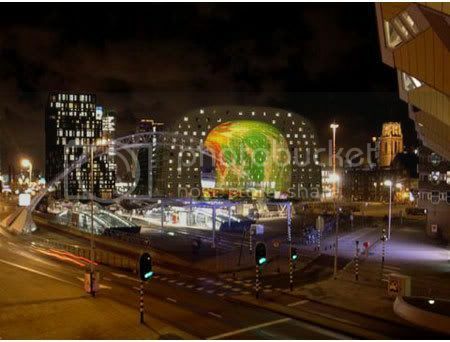 The Market Hall or Markthal is the first covered , permanent food market in the Netherlands under the new laws. Location: Grote Markt, next to the Hoogstraat in the Laurens quarter, Rotterdam, The Netherlands. New laws in the Netherlands require covered areas for traditional open air meat and fish markets due to new hygienic constraints. The Market Hall is part of the new inner city heart for the Laurens Quarter, the pre-war centre of Rotterdam. A sustainable and intelligent combination of food, leisure, living and parking. Fully integrated to enhance and use the synergetic possibilities of the different functions. A large scale building fitting into the neighbourhood, with main entrances linking up with the natural flow of the public circulation to the train station and the main shopping streets; with separate entrances for the parking garage and the apartments. 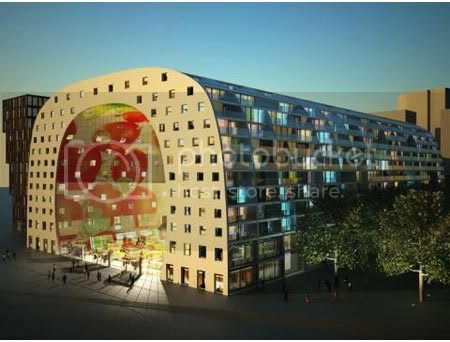 A building with inner logistic and an attractive and economical parking garage. 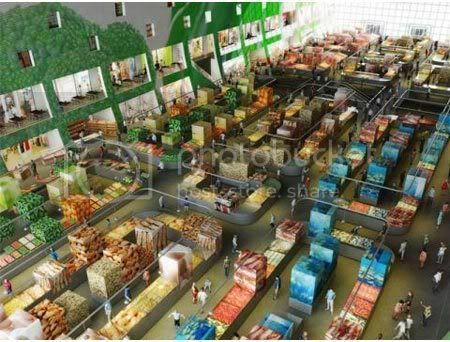 The market will include 100, mostly permanent, stalls covering a total gross lettable area of 1,800 m2. It is expected that 65 vendors will utilize the space. The Market Hall also comprises a total gross lettable retail area of 3,000 m2 and total gross lettable catering area of 1,600 m2 on the ground level and first floor, as well as a supermarket of 1,800 m2 and an underground car park for 1,100 cars. 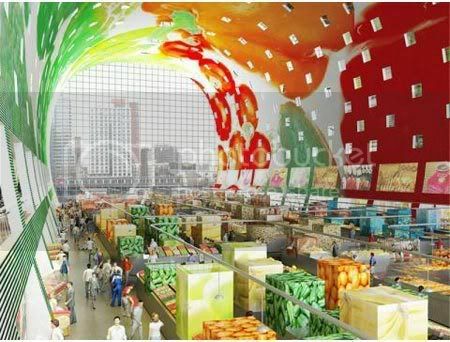 The Market Hall is housed in an arch-shaped building, and will include 246 residences. A covered square with a pleasant public security and controllability emerges of it. 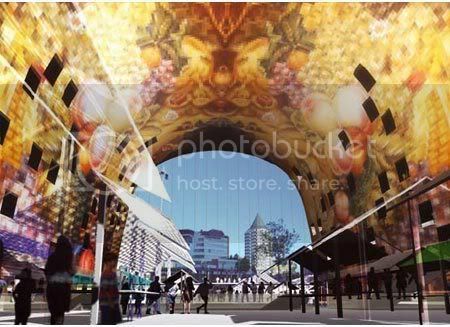 During day it serves as central market hall, after closing hours the hall will be an engaged living area with light and liveliness enriched by the restaurants situated on the first floor. The apartments follow the strict Netherlands laws regarding natural daylight: all rooms that require natural light are situated on the outside. Kitchens, dining rooms and storage are positioned at the market side, establishing a connection to the market. The interior of the arch will be covered in LED technology providing the city with an ever changing interior. The front and backside are covered with a flexible suspended glass facade, allowing for maximum transparency and a minimum of structure. 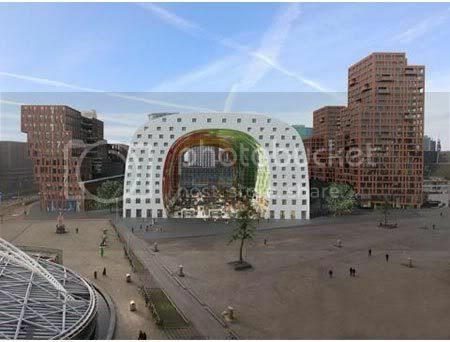 A new icon for Rotterdam, a public building emerging from housing.